The little beauties are not the easiest models to work with, but with a little knowledge and practice you can expect to come back with at least a couple of nice shots after a short excursion in the wild. The shots may not make you rich, but you'll have fun, and you may be surprised to learn how many butterfly species you can find. 1. Plan your excursion. Get a butterfly book for your area, and learn when, and where you can expect to find common butterflies. Some like meadows, others prefer forests or bogs. Some species defend a tiny territory, and others travel long distances in a day. Flowers are common food sources. Also learn about any special behavior for a species you may find. Understanding what they are up to can help you getting your shots. 2. Choose the right equipment. It's difficult to get really close to the insects so a macro lens may not be needed. You should use a telephoto lens though, and the closest focusing distance should be 0,5-1,5 meters (2-5 feet). 150-300 mm is probably a good focal length, and a prime should be fine since you probably end up on about the same distance from the subject, and they all tend to be roughly the same size (25-120 mm wingspan). A flash (for filling shadows) is useful and don't seem to bother the insects at all. I've used a 70-200 mm f/2,8 zoom that focuses from 0,9 meters (3 feet). 2. Find the models. Choose a sunny day (at least if you're in temperate climate zones). With the knowledge about where to find your species, and a detailed map (or why not Google Earth or Google Maps?) you can find some good destinations in your area. 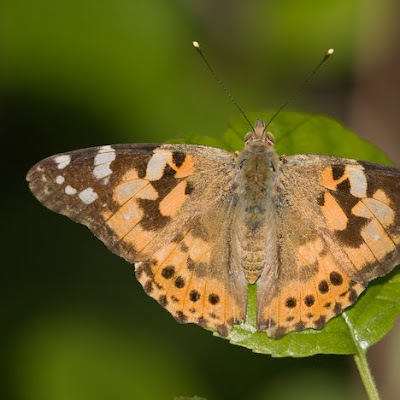 You may not see a butterfly right away so hang around in a place for a while and walk around in fields, along trails or small roads and near trees or bushes. If there are butterflies there, you should either see them flying in the distance or when you surprise them where they sit and feed or rest in the sun. You may not see them unless they fly. 3. Sneak up on the model. Try to follow a flying butterfly until it lands again, but keep you distance so you don't scare it. They won't actually understand that you are a danger as another animal (as birds would). They will just react instinctively to sudden movements within a certain radius around them. Understanding this behavior, and expoliting it, is the key to getting good butterfly shots without too much frustration. As you move in close to take the shot you need to slow down and avoid any sudden movements with any part of your body or gear. Theoretically you can move all the way up the the butterfly while it's eating, defending territory, feeding or mating, but i practice it's difficult an takes too long (and your focusing distance may be a limit). The closer you get the easier it is to scare your model, and you have to start all over again. Start shooting when you're at a good distance and have a good composition, and don't forget to stay still.